Thanksgiving is upon us next week. This is the time of year we take a moment to reflect upon our lives and our blessings. 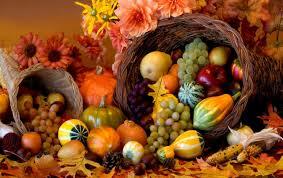 And let’s not forget the amazing feast we all look forward to all year long. Along with the celebration and joy comes the stress of hosting, gathering and preparing. So how do we beat the stress? Aww the meal… so how do we not spend the whole day in the kitchen? Prep. Take the days leading up to the big day and prepare as much ahead of time as possible; chop, mix and store. The day before cook almost everything, so that the day of all you have to do is heat the meal. If you are the host, delegate. Ask your guests to bring a side dish or desert. Set the table or prepare the buffet the night before. Wrap the silverware, place the name cards and arrange your center piece the night before so all that is left are the finishing touches right before your guests arrive. Most of all ENJOY the day. Remember this is the day to gather with your friends and family. Thanksgiving is more than the meal; it’s the day to give thanks for all of the love and blessings we have in our lives. Nothing matters more than taking the time to enjoy the moments we have with each other.